Deadly snakes or just pretending? ANN ARBOR — For more than a century, brightly banded and sometimes deadly coral snakes have been held up as textbook examples of a mimicry system shaped by evolution, in which a harmless species deters predators by imitating a harmful one. 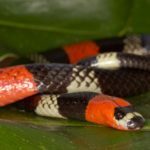 More than 150 species of coral snake mimics have been identified, each bearing the distinctive red-and-black banding of its venomous counterpart. Even so, coral snake mimicry remains controversial among some biologists because of perceived conflicts between theory and observation. Now, by combining genetic data and information from 300,000 snake specimens housed at natural history museums around the world, a University of Michigan-led research team says it has resolved part of the century-old conflict known as the coral snake mimicry problem. 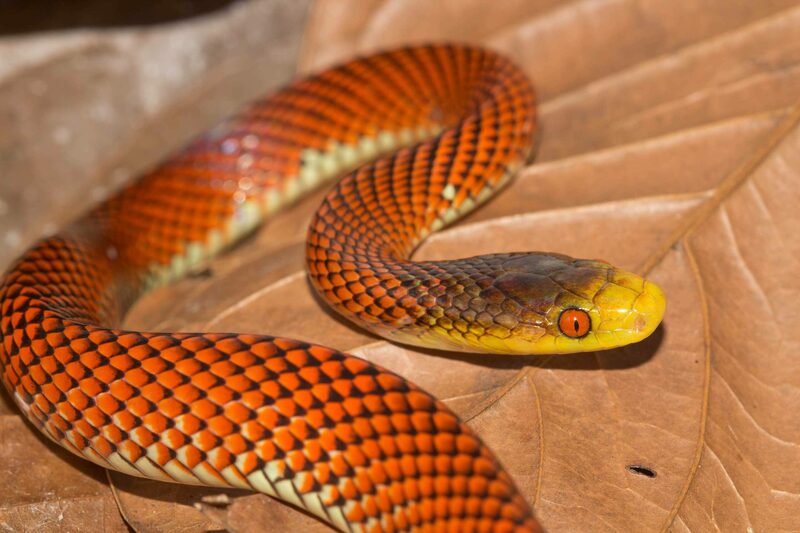 U-M evolutionary biologist Alison Davis Rabosky and her colleagues showed that much of the apparent conflict between theory and observation disappeared when the global distribution of all snake species was taken into account. 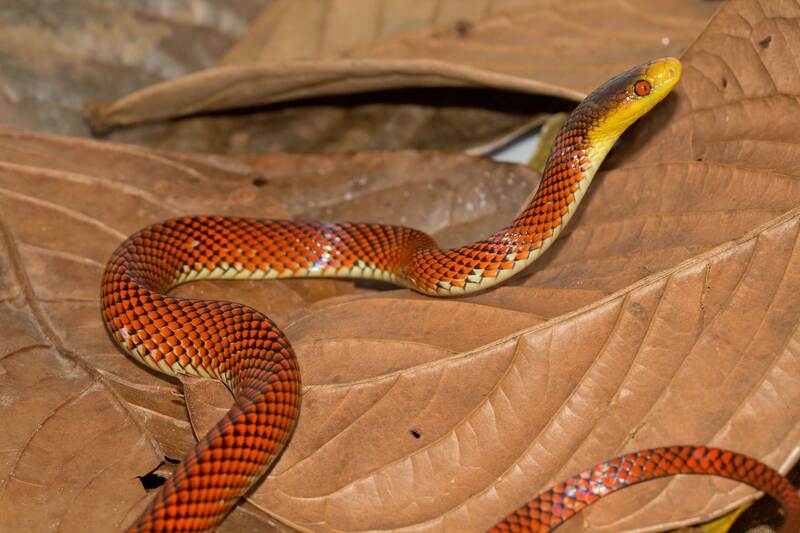 In a paper scheduled for online publication May 5 in Nature Communications, they present the first definitive evidence that the spread of coral snakes throughout the Western Hemisphere over the last 40 million years drove the distribution of the mimics. 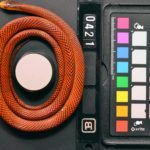 During that time, the distinctive coloration of the coral snake mimics evolved independently at least 19 times in the New World, according to the researchers. 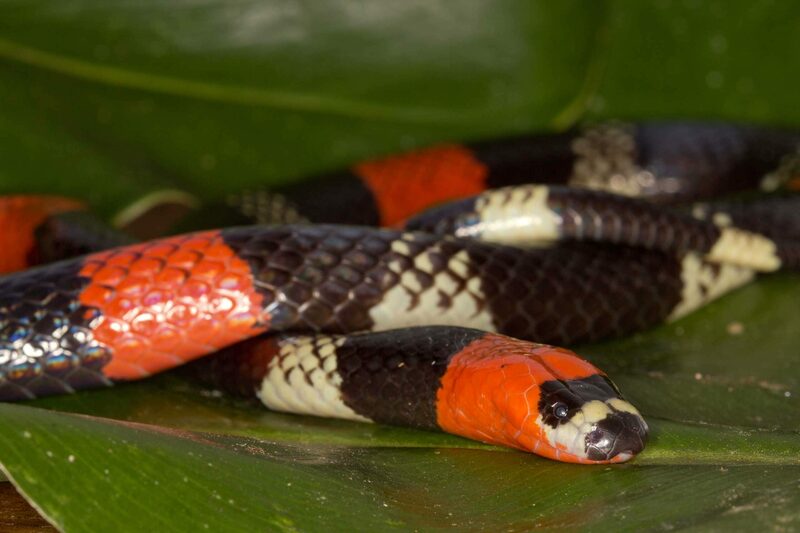 And in all instances, red-and-black-banded mimics arose only after coexisting with coral snakes, as predicted by mimicry theory. 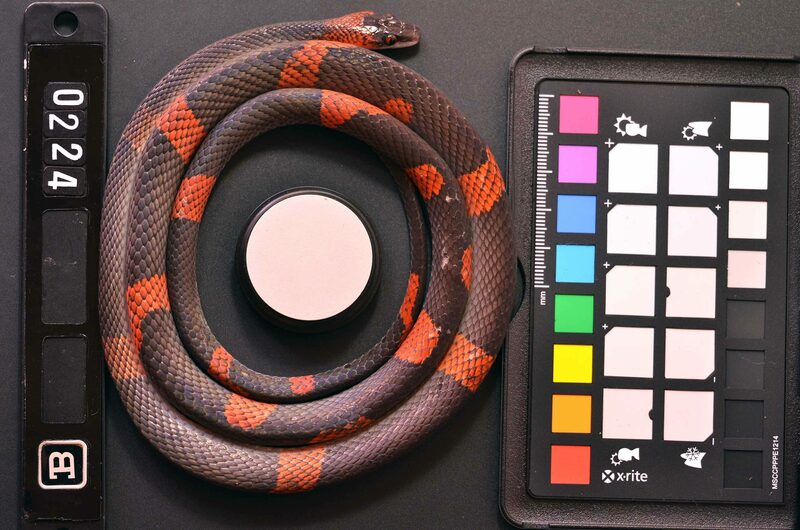 “By using pioneering, global-scale tests only possible with the ‘big data’ from natural history museums, we show how coral snake mimicry can persist, despite breaking all the rules,” said Davis Rabosky, an assistant research scientist in the U-M Department of Ecology and Evolutionary Biology and an assistant curator of herpetology at the Museum of Zoology. “We also identify profound gaps in mimicry theory and thereby provide new insights into the best targets for future research,” she said. 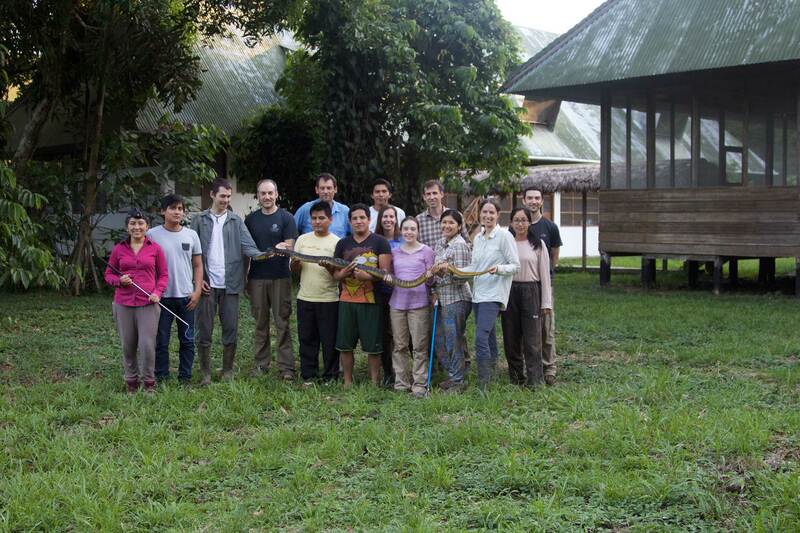 In March, Davis Rabosky and six colleagues spent three weeks in the Peruvian Amazon on a collection trip organized by the Division of Amphibians and Reptiles at the Museum of Zoology. 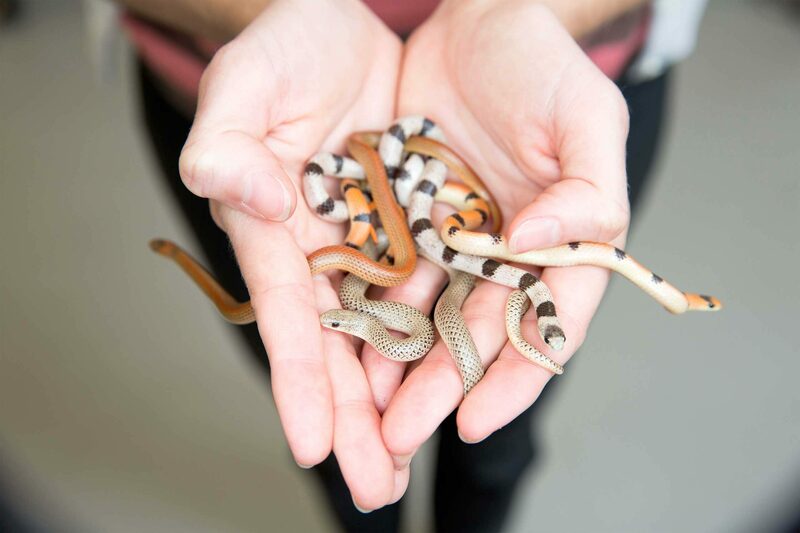 She collected coral snakes and their mimics for a follow-up study to test possible explanations for findings presented in the Nature Communications paper. The group included two U-M faculty members, a postdoctoral researcher and four graduate students, as well as eight Peruvian students. 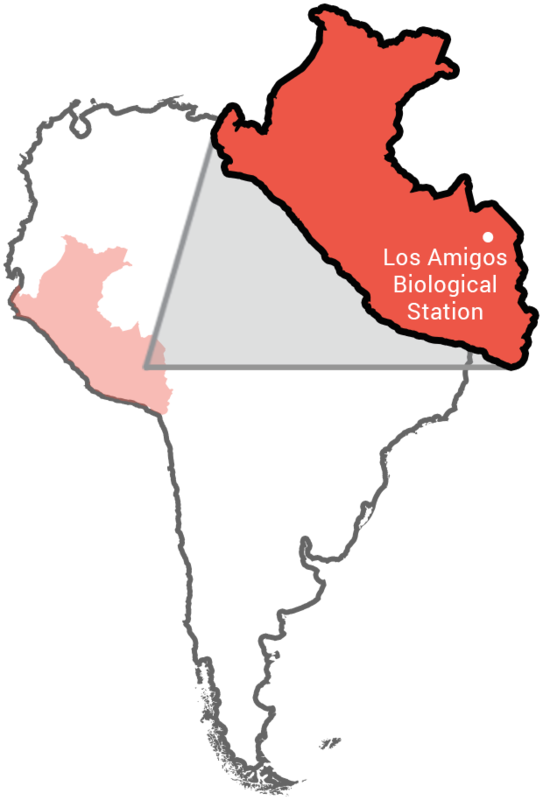 They conducted most of their work at the Los Amigos Biological Station in southeastern Peru. U-M graduate student Pascal Title looks out over the Madre de Dios River at Los Amigos Biological Station in Madre de Dios, Peru. Highly venomous South American coral snake, Micrurus lemniscatus. International team of researchers led by the University of Michigan on expedition at Los Amigos Biological Station in Madre de Dios, Peru. A harmless coral snake mimic, Oxyrhopus formosus. According to the coral snake mimicry problem, the brightly banded neotropical snakes violate two major theoretical predictions: that mimics should not occur outside the geographical range of the venomous species and that harmful species should be more abundant than mimics. 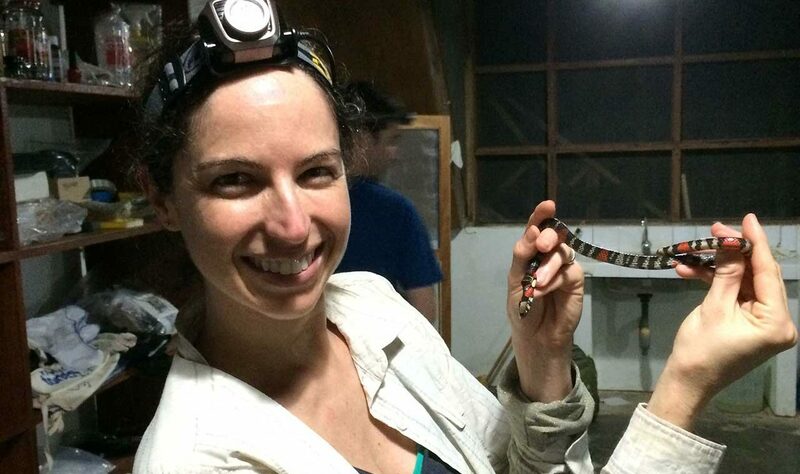 Davis Rabosky and her colleagues used data from more than 1,000 New World snake species to test for a positive spatial correlation between coral snakes and their presumed mimics. 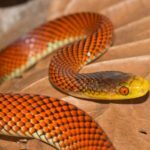 The researchers found a striking predictive relationship between the number of coral snakes in a particular region and the number of mimics. And contrary to previous reports, they found that coral snakes and their mimics actually do occur together in both space and time. Previous mimicry studies failed to take into account global geographic patterns of species richness in all snakes. Once those patterns were included, the previously reported conflict between theory and field observation disappeared, she said. The most surprising result was evidence for widespread evolutionary losses of mimetic coloration, a finding that strongly rejects the longstanding idea that mimicry is an irreversible process—an evolutionary one-way street. Many previous studies of insects such as butterflies suggested that mimicry is a stable evolutionary endpoint. Once the mimic acquires a coloration that protects against predation, that color pattern is retained indefinitely, the insect studies suggested. 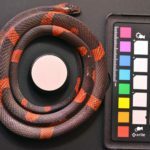 But Davis Rabosky and her colleagues found something quite different with coral snakes and their mimics: evidence for both rapid gains and losses of the conspicuous red-and-black banded color pattern through evolutionary time. The majority of those gains and losses occurred in the tropics over the last 15 million years. “Here, we not only found the first irrefutable evidence of mimicry loss in any system, we found lots of losses, scattered across many groups of snakes and many geographic areas,” Davis Rabosky said. Another major prediction of mimicry theory is that the harmful models should outnumber the harmless mimics. But Davis Rabosky and her colleagues found that the number of mimetic species at a given location was two to six times higher than theory would predict. 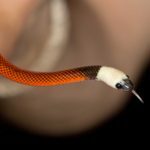 “We found that a coral snake mimic problem does, in fact, remain,” said study co-author Daniel Rabosky, an assistant professor in the U-M Department of Ecology and Evolutionary Biology and a curator of herpetology at the Museum of Zoology. 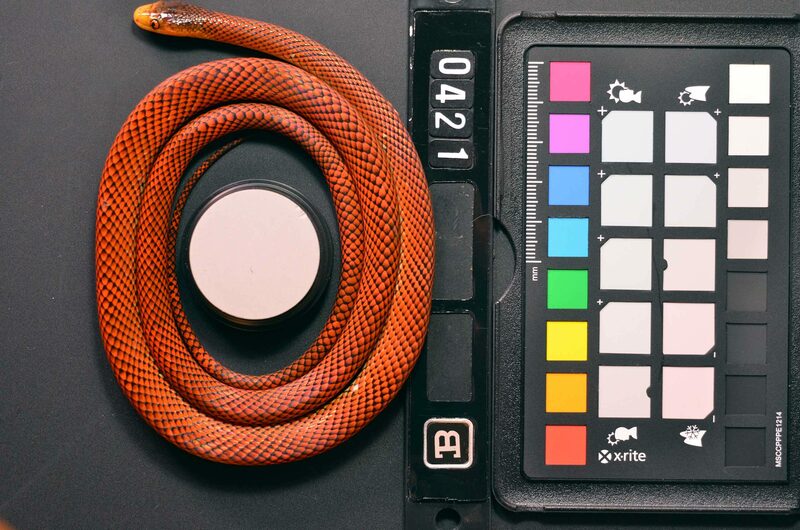 “However, the problem is not about whether coral snake mimicry exists at all—as originally described—the problem is about what factors are responsible for the very fast and unexpected dynamics of snake coloration over time and space,” he said. 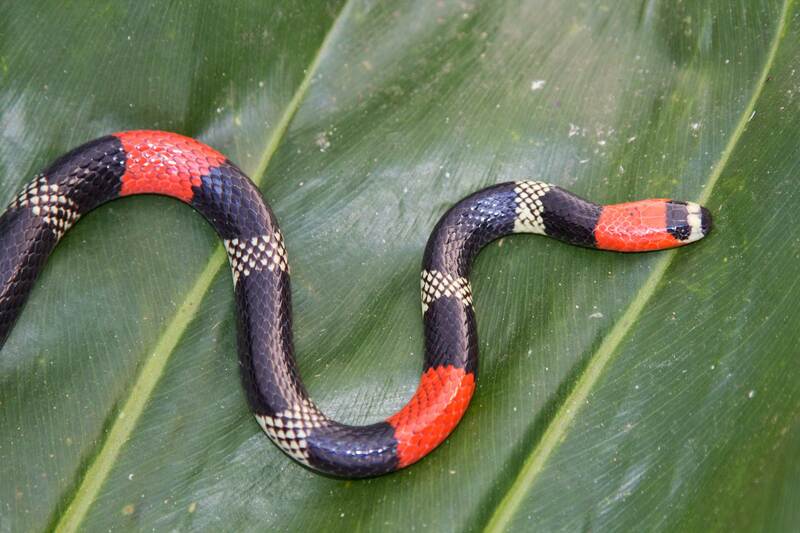 Coral snakes produce a potent neurotoxin, and bites to humans can be fatal if left untreated. 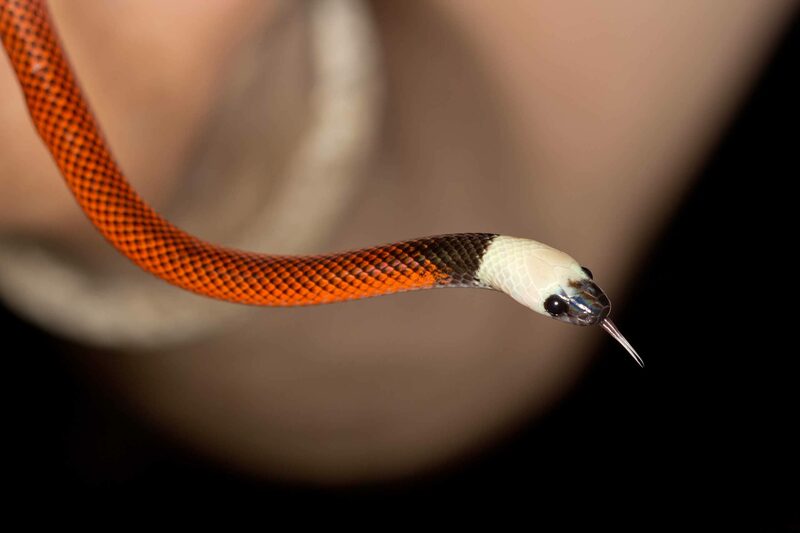 Coral snake bites are extremely rare in the United States, and patients who receive prompt medical care usually recover. The other authors of the Nature Communications paper are U-M’s Pascal O. Title and Iris A. Holmes; Christian L. Cox of Georgia Southern University and the University of Texas-Arlington; Anat Feldman of Tel Aviv University; and Jimmy A. McGuire of the University of California, Berkeley. The research was funded by a National Science Foundation Postdoctoral Fellowship in Biology to Davis Rabosky and by the University of Michigan.